Jesus tells us, “Do not be anxious about anything.” Yet if there’s one command of Jesus that we often disregard without a second thought, surely it’s this one! 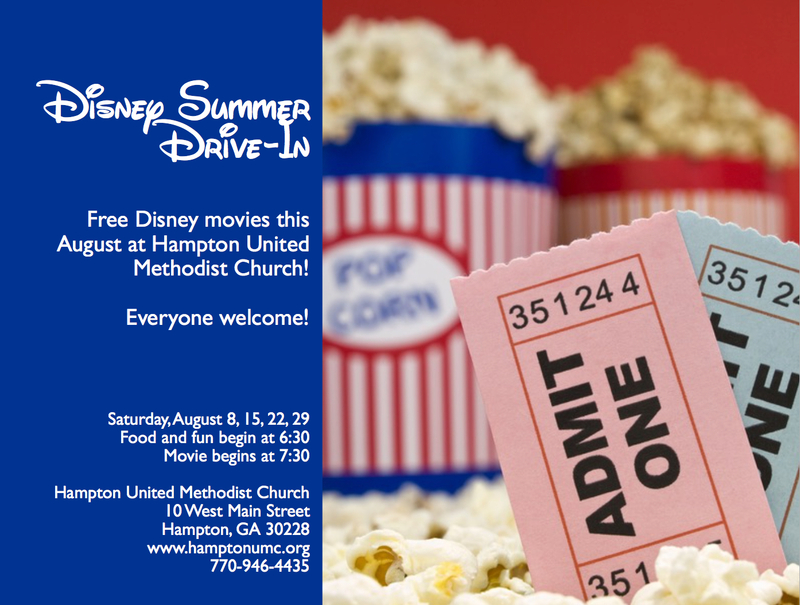 In this first installment of our “Disney Summer Drive-In 2015” series, I use the movie Finding Nemo to explore this theme: How does Jesus set us free from worry? The following is my original sermon manuscript. During the sermon itself, I showed four two-minute movie clips. I describe each clip below in italics. Finding Nemo begins with a young married couple, a clownfish named Marlin and his wife Coral. They’ve just moved into a new home on the Great Barrier Reef and started a family. They’re waiting for about a hundred eggs to hatch. They’re happy. Their dreams are about to come true. Then tragedy strikes: Marlin and his family are attacked by a barracuda. The only survivors are Marlin and one tiny egg. In the first clip, Marlin holds the one remaining egg in his fins and says, “I’ll never let anything happen to you.” Then we see Nemo getting ready for school the first day. Nemo is enthusiastic for this new adventure. His father, meanwhile, is cautious and fearful. He reminds Nemo how dangerous the ocean is. We have a cat named Peanut. He’s a large cat—some might even accuse him of being fat. I prefer “big-boned.” But inasmuch as he is fat, it’s because he’s trained us to stop whatever we’re in the middle of, to go upstairs, and to fill his food bowl. Right away! He’s very manipulative about it, too: When the food bowl is empty, you see, that’s when he becomes most affectionate—constantly rubbing up against our legs, purring loudly, jumping in our laps, meowing. He’s learned that if he just acts like he loves and cares for us, we’ll give him what he wants. One thing is for sure: He doesn’t take “no” for an answer. He’s patient. He’s persistent. He doesn’t give up. I joked with a friend that since we always do Peanut’s bidding, it’s as if we’re his pets! But I will say this for him: He lives a life of total dependence on us. His only source of food comes by way of Billy Crawley and the good folks at Purina, and it’s in a large container with a lid on it that Peanut can’t open himself—since he has no opposable thumbs. So he needs us humans. And he knows he needs us. He never worries about where his next meal is coming from—or even whether he’ll have a meal at all. 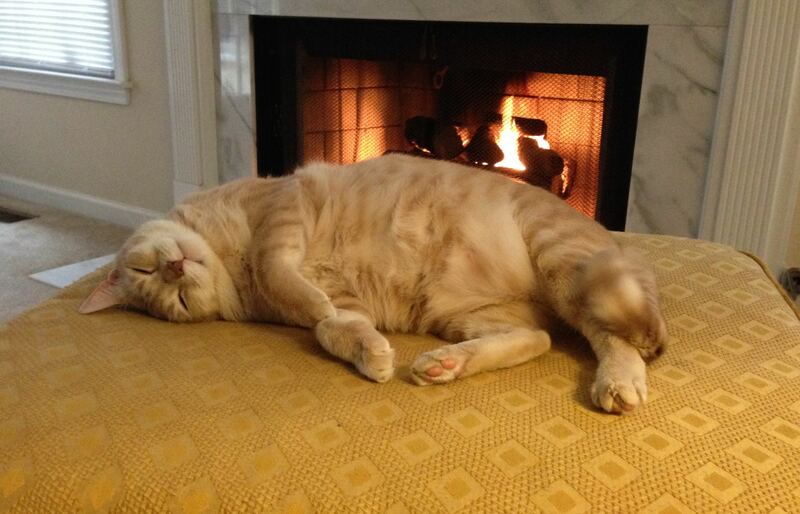 He’s lived for nine years this way, and he’s never gone hungry, even once—which is obvious when you look at him. 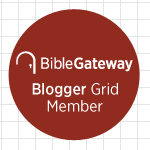 The life of Peanut is a real-life parable for us in our relationship with God. We are assured, from the words of our Lord, that our heavenly Father is always faithful to give us, his children, what we need. Jesus said, “Look at the birds of the air: they neither sow nor reap nor gather into barns, and yet your heavenly Father feeds them. Are you not of more value than they?… Therefore do not be anxious, saying, ‘What shall we eat?’ or ‘What shall we drink?’ or ‘What shall we wear?’… But seek first the kingdom of God and his righteousness, and all these things will be added to you.” Jesus commands us not to worry; not to be anxious; about anything! And yet, I suspect if there’s one command of Jesus that we routinely break without giving it a second thought, it’s this one. Why do we think that that’s O.K.? As you can see from this clip, Marlin also breaks this command of Jesus. He’s worried and deeply afraid for his son’s safety. In fact, Marlin’s overprotectiveness eventually causes his adventurous young son Nemo to rebel and run away—and Nemo get captured by a scuba diver, a dentist in Sydney, Australia. He puts Nemo in his office aquarium. 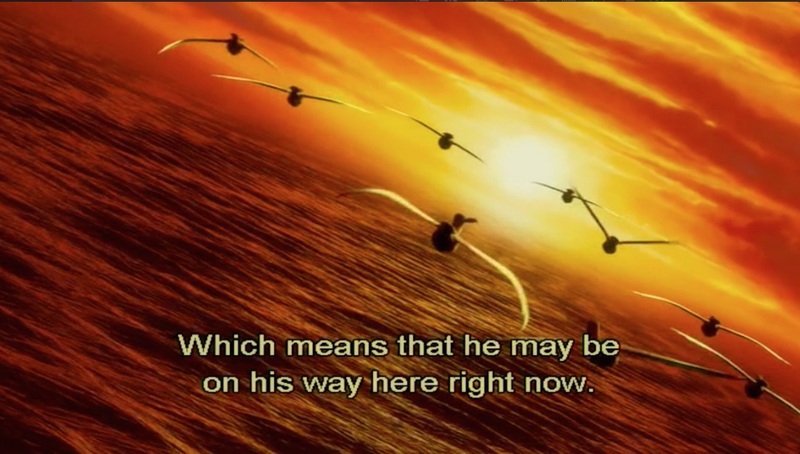 This causes Marlin to ignore his fear and head out in search of his lost son. He teams up with a forgetful blue fish named Dory. In their quest to find Nemo, the two fish come into contact with a scary-looking great white shark—who takes the two of them to an interesting meeting with two of his shark friends. In this second clip, a scary-looking great white shark escorts Marlin and Dory to a 12-step recovery program for sharks, who have resolved not to eat fish. Unfortunately, the great white smells Dory’s blood and begins to “fall off the wagon.” His two shark friends intervene. Dory and Marlin escape. Do you have something called “Penn Face”? What about “Duck Syndrome”? Yeah, I didn’t know what those were, either, until an article appeared in the New York Times a couple of weeks describing them. “Penn Face” is used by counselors at the University of Pennsylvania to describe students who act “happy and self-assured” on the outside, while inside they’re falling apart from incredible stress or depression. At Stanford they call it the “Duck Syndrome,” which refers to students who live like ducks—appearing to glide calmly on water while frantically paddling under the surface. As one Penn student said, “Nobody wants to be the one who is struggling while everyone else is doing great.” So you put up a front. The truth is, on the inside we’re all broken. We’re all messed up. We’re all struggling to keep it together. 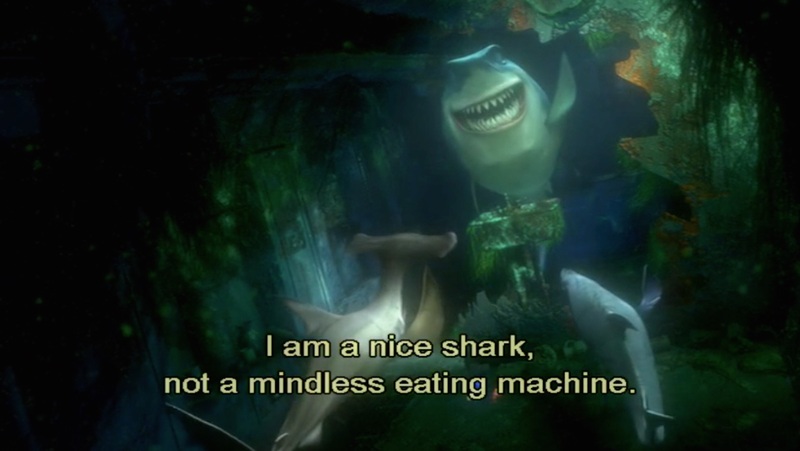 And that’s what I appreciate about 12-step programs like Alcoholics Anonymous—or even this 12-step programs for sharks. The people in these programs are so honest with one another: they know they’re far from perfect, and they’re trying to change. And even these sharks are sincerely trying to change! At AA meetings, members introduce themselves by saying, “I’m Brent, and I’m an alcoholic.” I wish church could be more like that—a support group for sinners: “I’m Brent, and I’m a sinner.” I wish church could be a place where we love and support one another in our common struggle with sin—without judging, without gossiping, without putting each other down. Well, our heroes, Marlin and Dory, managed to escape from this shark who “fell off the wagon.” The shark makes an appearance later in the movie, and he’s back on the wagon, you’ll be glad to know. Anyway, Marlin and Dory face a few more trials along the way. And the news of their great heroism begins to spread, as we see in this next clip. In clip #3, news begins to spread about Marlin’s heroic efforts to rescue his son—and that he’s on the way to Sydney right now. A pelican finds Nemo in the aquarium and tells him the news. Nemo doesn’t believe it at first. As the pelican continues, however, we see Nemo swell with pride: his father has taken all these risks for him! So Nemo hears about the great lengths to which his father goes in order to rescue him, and at first it seems too good to be true: “That can’t be my father.” He doesn’t love me enough to do all that… Does he? And the answer is yes: look what he did in Christ: God left behind the safety, security, and comfort of his home in heaven and became one of us. Through his suffering and death on the cross, he faced down our biggest enemies… sin… evil… death. And he defeated them for us. Because he loved us that much. When he died on the cross, he was doing it for you and for me… he was thinking of you and me. God goes to great lengths to save us. Will we, as his children, at Hampton United Methodist, go to great lengths to save others? If not, why not? Marlin and Dory are swallowed by a giant whale. Marlin fears that all hope is lost. He tells Dory that he promised Nemo that he wouldn’t let anything happen to him. “That’s a funny thing to promise,” she says. 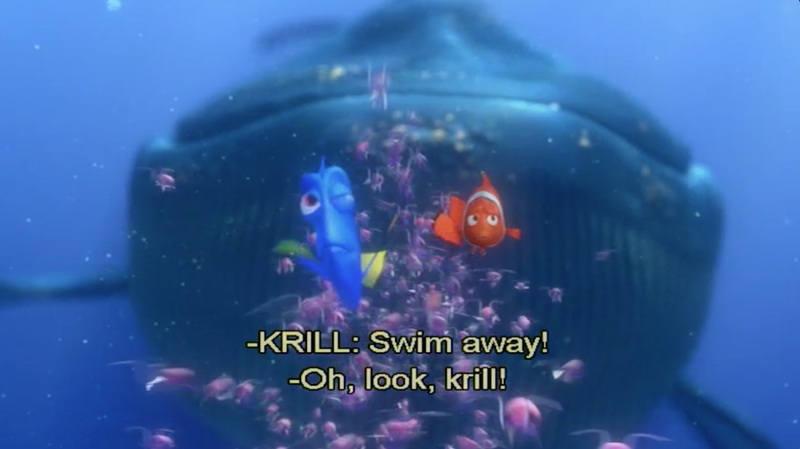 Dory communicates with the whale, who tells the two of them to “let go” of the its tongue and slide to the back of the whale’s throat. Marlin, fearing that he’s about to be eaten, reluctantly lets go. Instead of eating them, however, the whale blows the two of them through its blow hole and into Sydney Harbor. They’re safe. 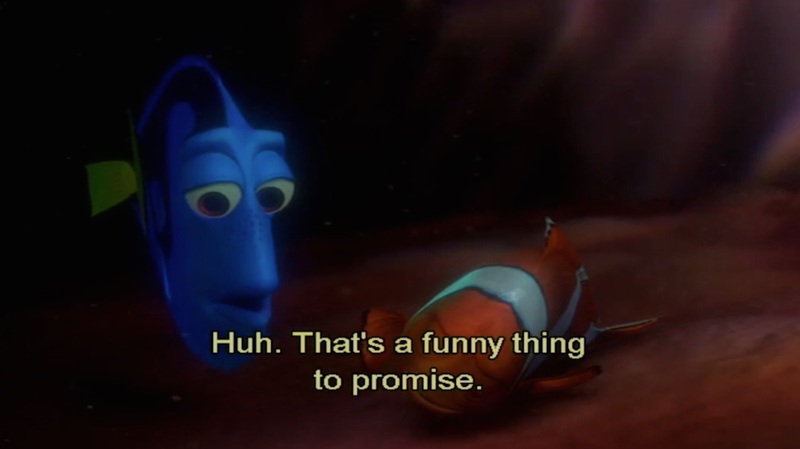 Marlin said, “I promised my son I’d never let anything happen to him.” And Dory said, “That’s a funny thing to promise.” Why does she say that? Because despite our best efforts, we’re not in control of our lives and our world. I made reference to this a few weeks ago, but it bears repeating: I’ve been thinking of those marines and that sailor who were killed in Chattanooga last month. Gunnery Sgt. Thomas Sullivan was one. He was in the Marine Corps for 18 years. He survived truck bombs; he survived a rain of mortar attacks during one of the most intense battles in the Iraq war; he earned a Combat Action Ribbon and two Purple Hearts. He survived all that; he earned all that. And I imagine that when he returned to American soil, the last thing he expected is that he would be killed by an enemy here. Not that America doesn’t have a problem with violent crime, but it’s not exactly a war zone! Jesus is saying, in other words, that if you’re going to worry, worry about today only. Confine all your worrying to what’s happening today. And then when tomorrow comes, you can worry about all the things happening tomorrow. This is very practical advice, because if we could only follow it, we would greatly reduce the amount of worrying we do. For example, I’m sure many of you are worried right now. But I bet most of you are not worried about what’s happening today. Most of you think that today is going to be fine. It’s tomorrow, or next week, or next month, or next year that worries you. It’s that doctor’s appointment on Tuesday. It’s that paper that we have to write three weeks from now. It’s that bill we have to pay at the end of the month. It’s that fear that we’ll be unemployed at the end of the year. 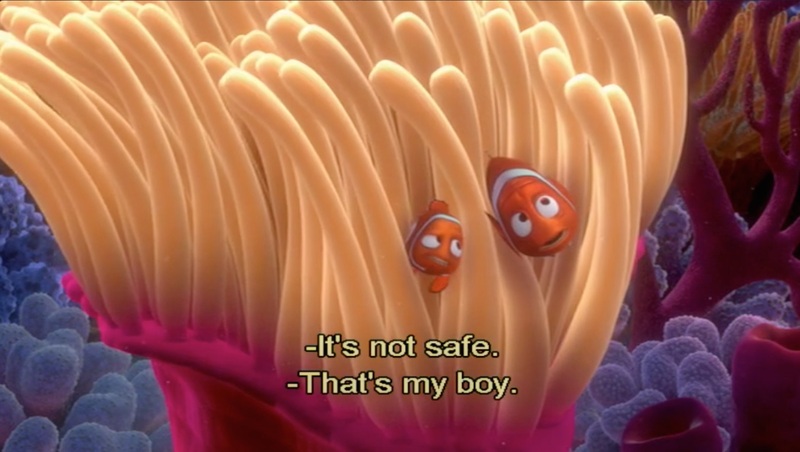 One more thing that this scene from Finding Nemo teaches us about worry: We often can’t imagine how God is using what we’re going through right now—whatever challenge we’re facing, whatever crisis we’re dealing with, whatever problem we’re trying to solve. After all, is this scary looking whale going to eat us the way Marlin imagines, or is this kind and compassionate whale going to shoot us out of its blow hole and save us? What we can know for sure is that God has a plan and a purpose for everything we’re facing—whatever it is. And whatever it is, it’s good. This entry was posted on	August 13, 2015 at 3:15 pm	and is filed under Uncategorized. You’ve hit on a big problem for me with respect to “worry about the future.” I can’t say that is my BIGGEST sin, but it is up there among the more significant. I always hear, “If you can trust Got to take you to heaven when you die, surely you can trust him with these lesser things.” True enough, but like St. Peter, I sometimes “lose focus” on Christ’s “control of events” and see all the waves, and begin to sink. Fortunately, the Lord is there to pull me up, as with St. Peter, but it is still sometimes difficult not to be “overwhelmed” with all those “big waves”! Speaking of which, what is your opinion (I think I know) on God’s “punishing” us Christians for disobedience? For me, the answer is clearly yes. But a couple of Christian thinkers I admire (I’m thinking of Tim Keller and Mark Galli) say no. They say that once we accept Christ we are only ever “righteous” in God’s eyes, so punishment is incomprehensible. Is this a widespread belief? For me, God’s “discipline” (call it punishment if you like) is a necessary part of sanctification. Further, consider David. “God has forgiven your sin–you will not die. BUT, because you have done this thing, the child that is born unto you will die.” And, “The sword will never depart from your house.” Sounds like punishment to me! Indeed, although some Christians would dismiss that as pre-Christian.